My parents were in Scottsdale, AZ looking at Kachina’s in the stores, and my dad wanted to meet an artist. One of the owners of the store put him in touch with Joe Gash. So they went out to the third mesa to Joe Gash’s home. 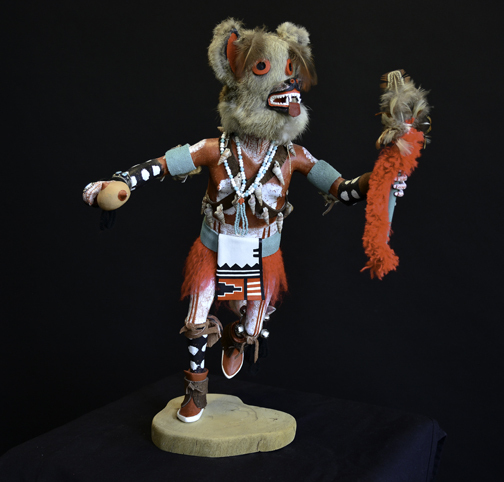 He met and liked him very much, purchased a Kachina from him that day. After my dad returned home, he began to correspond with Joe Gash. He had a couple of Kachina doll books and would look through them and would find a doll that caught his eye; hence, he would write to Joe Gash and ask him to carve it for him. A couple of months later, it would be delivered to his home., This is how he dealt with the purchases from him. After receiving the doll, he would send a check with an order for another one, along with any embellishments he liked (or didn’t like), i.e., he liked the way Joe Gash would use a turquoise ring that were made by one of his tribal members who made turquoise jewelry and use it as a bracelet on the doll. He then encouraged Joe Gash to continue trying new things. This went on for a few years. All of the dolls were purchased in early to late 1970’s. My dad became too ill after that to travel or purchase and passed in the 80’s. They have been displayed in a dust proof display case ever since their purchase and are in mint condition. Ricky’s father also began collecting Lelooska dolls around the same timeframe. The Lelooska family was of Cherokee descent but settled in the Pacific Northwest and soon became masters of the Northwest Coast carving traditions. 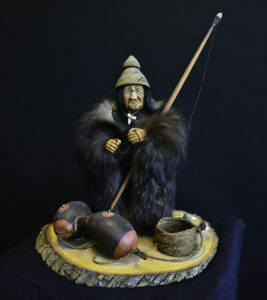 Their talent and dedication was recognized by Chief James Sewid, a Kwakiutl from British Columbia, Canada, and hereditary Chief of his people, who adopted the family. Shona-Hah is the mother of Lelooska, Kwunkwa-dzi, Patty Fawn, and Tsungani. She was born in a black walnut log cabin in Oklahoma’s old Cherokee Nation. There, she was given the name Shona-Hah, “gray dove”. Her Kwakwaka’wakw name, Tl’alilhilugwa, bestowed in 1968, means “whale rising”. Her dolls are valued highly by private collectors and museums as illustrations of vanished cultures. They bring alive both ceremonial and every day events in the lives of the people of many different North American tribes. From the Osage of Oklahoma to the Kwakwaka’wakw of British Columbia, she draws on first-hand knowledge of the cultures and the memories of the Old Ones for her inspiration. She passed away in 1997.